Gladys Marie Smith was born in Toronto in 1892. Shortly after the death of her father, she began appearing as a child actor in melodramas and road-show productions in order to help her family financially. In 1907, at the urging of Broadway producer David Belasco, she changed her name to Mary Pickford, and within two years was appearing in short films under the direction of D.W. Griffith. The camera loved Mary Pickford, and so did early movie audiences. By the age of 20, she had appeared in more than 100 films and eventually would be involved in more than 200 film projects as actress, writer and producer. With Charlie Chaplin, D.W. Griffith and her husband, Douglas Fairbanks, Pickford co-founded United Artists, becoming the first female movie mogul. Doug and Mary were Hollywood royalty, and their movies helped define the American feature film. Film historian Christel Schmidt was awarded two fellowships from the National Endowment for the Humanities to help finance her Mary Pickford project. The result is a stunning book that features several hundred rare images — many never before published and from Mary Pickford’s personal collections housed at both the Library of Congress and the Academy of Motion Picture Arts and Sciences. With wonderful period illustrations and a crisply written text, the life and career of the most renowned female star of the silent-film era is fully documented. Published on the 120th anniversary of Pickford’s birth, this work proves that the woman was a tough businesswoman and a pioneer of the modern film industry. She was one of the first to become a producer so she could control her own films. 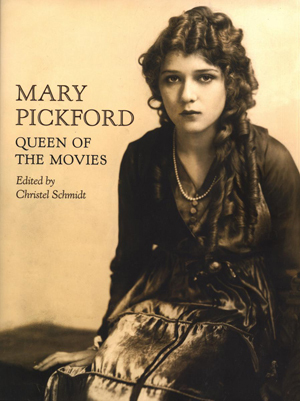 Pickford’s life and career are celebrated in this fascinating collection, which is fitting tribute to a woman who was both a talented actress and savvy industry leader.